During Mod Nights it has become common for people to not be able to easily switch to various SC versions, or to not even have a pre-SC:R installation at all. 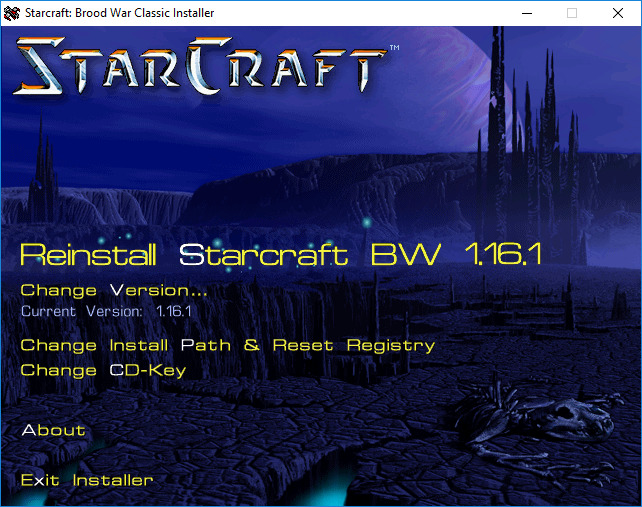 To remedy this (and since SD SC is apparently now free), I present the Starcraft Classic Installer. It's primary use is to create a full 1.16.1 installation, but it can also install/patch to any pre-1.17 version or reset the registry to point to an existing SC installation. 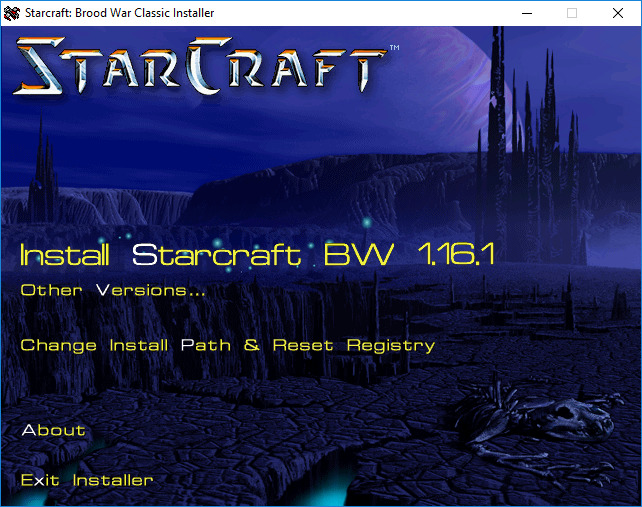 This makes a full 1.16.1 installation, including StarCraft.mpq and BroodWar.mpq. The installation also includes WMode.dll for windowed mode plugins and SFNoCD.dll to play pre-1.15.2 versions. 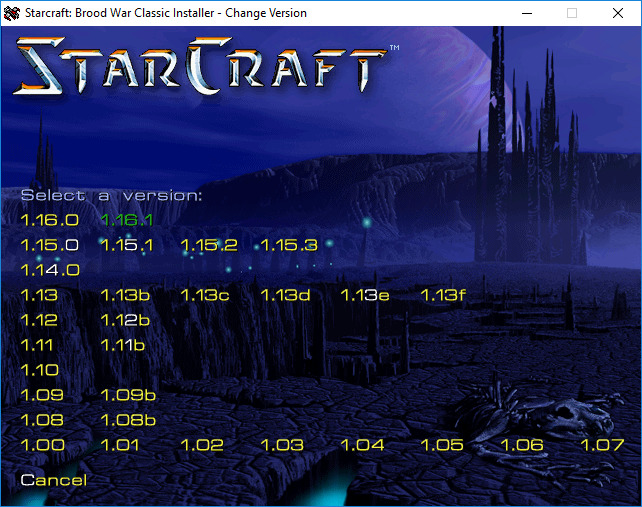 When installing or patching to a different version, it currently only changes starcraft.exe, patch_rt.mpq and related binaries. This means that StarEdit and all of the blizzard maps will remain from the 1.16.1 version, so let me know if you think there is a benefit to including blizzard maps for other versions and I can add them in to a separate map directory or something. The only battle.net gateway currently included with this is iccup. I removed the default gateways since they will only ask you to upgrade to SC:R. Let me know if there are any other gateways to include, otherwise they can be edited in rez\gateways.txt in either the installer's MPQ or in an installation's Stardat.mpq. Additionally, pre-1.08 versions have the battle.net gateway hardcoded in to battle.snp, which I have also changed to iccup. There are now three versions: a full version that includes the single player campaigns and cinematics, a lite version that does not and a patcher that only changes the SC patch version. Please leave any comments, bugs or suggestions, such as any battle.net gateways, maps or anything else to include with the installation. Also, tell me if there are any other prominent versions that should have hotkeys on the version selection screen. The ones that are currently hotkeyed are just the versions that I found memgraft or firegraft versions of. - Corrected the battle.snp gateway lists in versions 1.08 and above. - Loosened the "Installed.ins" requirements. - Verified that the selected "Change Install Path" directory contains an installation. - Fixed "Change Install Path" hotkey from 'r' to the indicated 'p'. - Added "Topic" link on the About screen. - Created stand-alone version patcher/downgrader. Post has been edited 8 time(s), last time on Jun 23 2018, 7:03 pm by FaRTy1billion. Oh wow. Another true Farty-tool: Nothing really big (or highly specialized), but incredibly useful. Created a standalone patcher, now I don't have to finish SCDG 4. XD This does not include any installer, so you must already have SC installed or a copy of an SC installation somewhere. If it can't find an installation, it will prompt you to locate an existing directory. Also, I noticed that the Change Install Path hotkey was 'r'. I fixed it in this one, but due to my internet's upstream I don't feel like uploading the fix for the other two installers for something so minor at the moment. If there are any other changes or suggestions, now is a good time to tell me. Is 1.17 compatible? When did it start using CASC? Also I don't think anything uses 1.17, especially since it was never really released. I don't have alpha. I might have a beta around though, but it will probably use a much different stardat.mpq which would make this really big. I think 1.17 was just a port of the code to modern compilers + support for modern systems, which was never finished since it morphed into SC:R. So I don't know if there is a real "1.17" version or just lots of intermediate builds. If beta stardat isn't too different you could put the changed files in a patch_rt.mpq file and ignore it. I just was curious if anyone had those versions. I think I got the beta files from this archive. Not sure if it's complete. 1.00 and 1.01 don't have patch_rt as far as I can tell, and I've never compared the difference in MPQs.